Welcome to the first post in my new series focusing on craft shows! I plan to focus on very specific topics – booth props, shelves, booth structure, considerations for outdoor shows, etc. – examining the needs and concerns of the book artist. I don't really consider myself an expert on craft shows, even though I’ve been doing them for 10 years. The fact is that every year, I learn something new (usually the hard way). I hope to offer one bookbinder’s experience of doing craft shows. Several other BEST members have already written posts about craft shows, so I’ll refer to them whenever appropriate. If there’s something specific you’d like to see me talk about, feel free to shoot me an Email – I’m open to suggestions! In this post, I’ll focus on one way you can support your books (and I don’t mean with therapy) - book stands. One advantage of book stands is that you can display books so they show from the front, without having to have them stand them open on the shelf. If people can see them, they’ll be more likely to buy them. Stands help to prevent damage by stabilizing the books and preventing them from falling over. You can also use stands to display open books, which can be handy if you make books with content or wish to show a book in use (with photos or text in it). You don’t want them to be too attractive, because then they’ll take attention away from the work – your books should be the focus, not the stands. They need to be durable and should be able to handle frequent use. They need to be lightweight so they are easy to transport. You need them in quantity, so they should be affordable. I’ll be talking about a few styles of book stands that fit these criteria. They nest when folded up, saving storage space. Come in black or white vinyl-coated wire or zinc-plated wire. The vinyl-coated wire is slip-resistant. If you have taller books, you can get a 3-wire easel which will give your books additional support from the back. 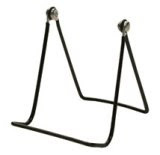 If you have a gridwall system, you can get the 2-wire easel in gridwall holder form. Books can stick to the vinyl-coated wire base, which makes for awkward removal by customers. White vinyl-coated wire gets dirty and requires occasional cleaning. The clear acrylic base is almost invisible when in use. The base is very stable and doesn’t tip over easily. You can get this stand in a miniature size, either in black or clear. If you have a gridwall system, you can get the Vinyl-coated acrylic base easel in gridwall holder form. The acrylic bases can break if not stored properly. Clear acrylic makes the stand "disappear" into a display. The lip keeps books from falling off – your work will be secure. Takes up more storage space. There's no way to lock the stands in a closed position, so they are not completely stable. The decorative quality may distract people from your work. Gibson Holders Incorporated was kind enough to grant permission for the use of their product photos in this post. 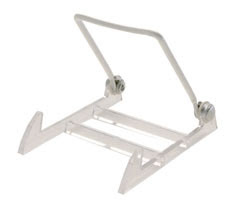 They manufacture display stands and you can order directly from them (they supply Brodart). You can view images of BEST member craft show displays in this post by Rhonda Miller of MyHandboundBooks. I'd love to see what you use to support your books! If you have used book stands at craft shows, whether similar to or different from those shown above, send me photos and I'll try to include them in a follow-up post next week. Be sure to include your name and a link to your Etsy shop. I'm so glad you guys are covering this topic! Great overview.